Beloved and famous Grand Teton Grizzly Sow 399 and new set of triplet cubs made their debut on June 5, 2011 to the delight of many, but especially to Jackson Hole and Yellowstone’s cadre of wildlife photographers like myself. 399 the four-hundred-pound grizzly acquired her unimaginative moniker in 2001 when, as a five-year-old sow, she was trapped and fitted with a radio collar so researchers could track her. Grizzly 399 was born to a mother who had no history with the legendary Yellowstone Grizzly Bear Study Team that tracks bears across the Greater Yellowstone Ecosystem. During the summer of 2004, 399 emerged from her den with a single cub, but the cub disappeared. It is assumed the cub had a deadly encounter with an adult male grizzly which are known to kill cubs. Male grizzlies are the greatest treat to cubs, as female grizzlies will not come into heat as long as they are nursing cubs. 399 once again is delighting tourists and photographers in the meadows along the road as she is often spotted digging for ground squirrels, wild onion, yampa root, and Indian potato. She and her cubs also graze on plants like dandelion and clover often with the intensity of other grazing animals. 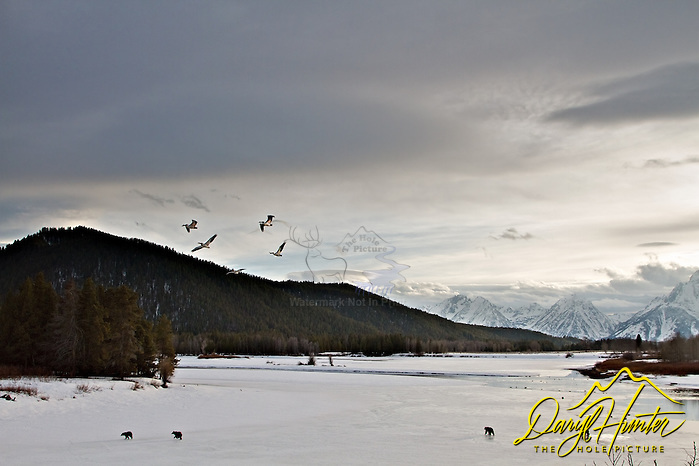 It’s nature’s salad bar that precedes the arrival of early summer’s main course, newly born elk calves. Once the feast of elk veal decreases from the elk calving grounds, surviving elk calves become harder to catch, the grizzly family returns to the salad bar of the meadows. In late summer, their diet turns to white bark pinecones and berries. 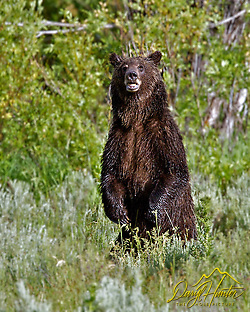 In 1970, Yellowstone and Grand Teton National Parks initiated an intensive bear management plan with the objectives of restoring the grizzly bear populations to subsistence on natural forage. This action was taken because the bears of Greater Yellowstone had become habituated to humans and dependant upon humans for food. As part of the new bear management program regulations prohibiting the feeding of bears became strictly enforced, as were regulations requiring that human food is kept secured from bears. In addition, garbage cans were bear-proofed and garbage dumps within the park were closed. The results were disastrous for the existing grizzlies in Yellowstone as most died of starvation because they didn’t know how to find natural food. After this crash of the grizzly population, they were added to the endangered species list in 1975. 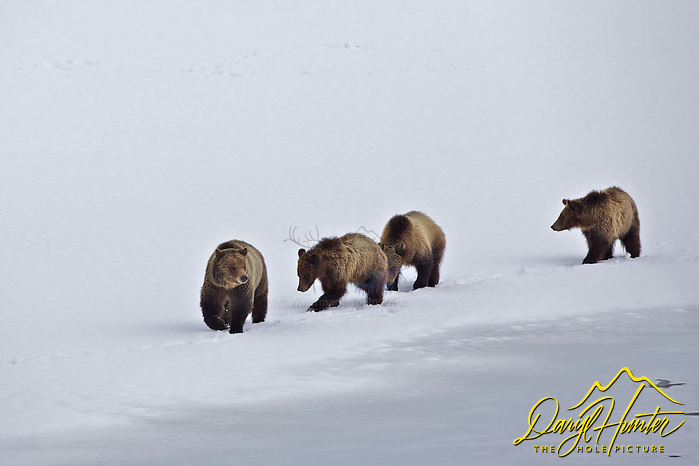 The 150+ remaining bears figured out how to survive naturally and these survivors taught their cubs too forage and hunt for natural food, and now we have a thriving population of grizzlies in Yellowstone that isn’t dependant upon human food. Grizzly 399 knows how to forage and hunt, and has taught those skills to her offspring. Grizzly sows hold premium value in our wild grizzly population. 399 has delivered two sets of triplets and is a key player in the exponential expansion of the Yellowstone grizzly population. We photographers and wildlife watchers of Jackson Hole and Yellowstone who have assumed the role of amateur cognitive ethologists have concluded that 399’s predilection for frequenting areas rife with humans may be purposeful. Our ethological-projection is merely guesswork by amateurs, but we surmise that 399 has determined that as annoying as we humans are, we are not dangerous. Conversely male grizzlies are the greatest threat to bear cubs. Male bears kill cubs to expedite breeding because female bears won’t come into heat as long as they are nursing cubs. Male grizzlies steer clear of human congestion; therefore congested national park habitat may be safer for sows with cubs than deep wilderness habitat. Biologists say 399’s strategy of remaining in proximity to human habitation may have kept her cubs safe from egocentric boars. Nonetheless, she and her cubs remain wild, foraging naturally in a healthy way. 399 is remarkably attentive, passing on the instincts of survival necessary to survive on the edge of a wilderness adjacent to a crowded human world. The cubs are cute no question about that, but a female grizzly with cubs happens to be one of the most dangerous animals in North America. In 2007 this normally ambivalent sow bit a Dennis Vandenbos in the posterior after he surprised the four bears feeding on an elk carcass. Dennis first tried yelling to frighten the bears away but after failing to scare them away he laid down on his stomach in a submissive posture in an attempt to fain death. One of the bears then attacked inflicting lacerations and puncture wounds. 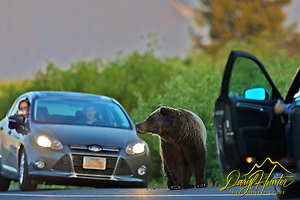 A nearby Grand Teton Lodge Company employee who luckily happened upon the scene frightened the bears away. The attack likely resulted from a defensive response while protecting their food source so no action was taken against 399 because of the attack as she was acting in a natural way. All the cubs 399 delivered in 2006 reached adulthood, which is a statistical anomaly that rarely happens in nature. Grizzly sow 399 may know what she is doing. Grizzly cubs are weaned around June of their third spring. Young sows may hang around their mother for another year, sharing her home range, and eventually becoming her replacement in the circle of life. Young boars however strike out to establish their own territory. To the delight of many grizzly 610 one of 399’s cubs from her 2006 crop of cubs, also showed up the same spring with two new cubs of her own. Grizzly 610 seems to be emulating her mother as she seems to be comfortable near park roads and relaxed with yet attentive with her new cubs, She seems comfortable with people and vehicles as is 399 as she straddles her between wilderness and humanity. For those who see 610 and her brood the experience will be as special. And those who know her family history will likely be even more appreciative. An interesting turn of events occurred sometime between July 16 and July 20, 2011. Grizzly photographers were watching a grizzly at Willow Flats they believed to be grizzly 399 because of the three cubs in tow when one of them noticed the yellow ear tag which indicated this sow was grizzly 610 not 399. Confusion, speculation, and apprehensive fear followed as all who know them were now worried about the welfare of grizzly 399 and the other two cubs. To everyone’s relief Grizzly 399 was seen a short time later with two cubs. 399 has a red ear tag. Why the swap occurred isn’t clear, adoption of cubs between two female bears is rare, but not unprecedented. 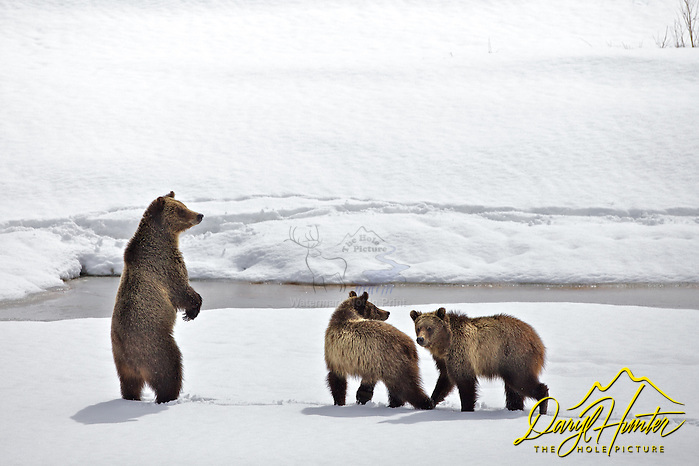 In 2007, biologists documented a female grizzly that adopted two cubs from another female near Dunraven Pass in Yellowstone. Cub adoption events may occur after there has been a disturbing incident, such as an encounter with bears, and, in the process, the cubs get scattered. One theory is that a large male grizzly bear may have had an altercation with 399 while in the vicinity of daughter 610. Witnesses reported hearing screaming bears on the evening of July 18 at Willow Flats, the following morning a large male grizzly was seen in the vicinity. Both biologists and astute bear watchers and photographers believe this may be an example of wild kingdom altruism because five-year old 610 may have kept the cub because of her youth as she may be better equipped to get three cubs to adulthood than her mother 399. A wild grizzly’s life expectancy is about twenty years old so 399 who is believed to be fifteen or sixteen years of age is well into grizzly bear old age. Considering this, 399 would have a much tougher time nurturing, defending then successfully weaning all three of the triplets. These observations offer a fascinating glimpse into bear behavior. Scientists speculate that cub adoption in bears is an adaptive behavior that increases cub survival. Since July 20th the two bears have had the opportunity to straighten out any accidental mix-up that might have happened during any emergency scattering of cubs so I choose to believe warm and fuzzy altruism over Ursus arctos horribilis oblivious circumstance. Grizzly 399, her daughter, 610 and their broods are certainly going to be a net gain for the economy of Jackson Hole and Grand Teton National Park providing a boon for hoteliers, restaurants, gift shops, service stations and outdoor gear stores because of thousands of people coming to view them this summer and next. Jackson Hole won’t be the only monetary beneficiary though. I as are many other photographers are upgrading our premium lens arsenals to include 500mm, 600mm, and 800mm lenses that cost thousands of dollars apiece, a windfall for Canon and Nikon that has their executives smiling. 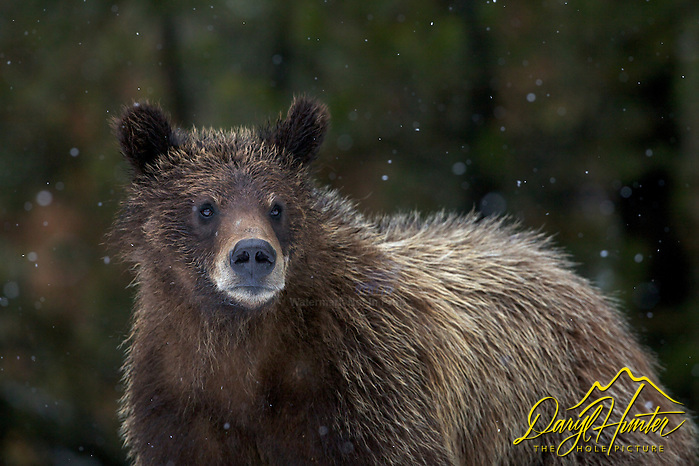 Photographing grizzlies is one of my biggest thrills much to the peril of the rest of my photographic checklist. I often retrospectively kick myself for driving past beautiful sunrises and gorgeous scenery in the hopes of getting to a good bear location where a bear may or may not show up. The anticipation of the thrill of finding then photographing these amazing animals causes me to jettison all photographic pragmatism if the hopes of capturing that perfect grizzly moment. Grizzly Bear Cubs Brownie and Ash, sadly Brownie is now dead and we don’t know about Ash. This new generation of the family excited biologists and frankly, everyone else. This clan is gaining worldwide attention from articles that are being published around the globe. 399 had a galvanizing influence, winning the hearts of all who have watched her. She changed the negative attitude that some people have about grizzlies, Grizzly 610, I am sure, will carry on the tradition. 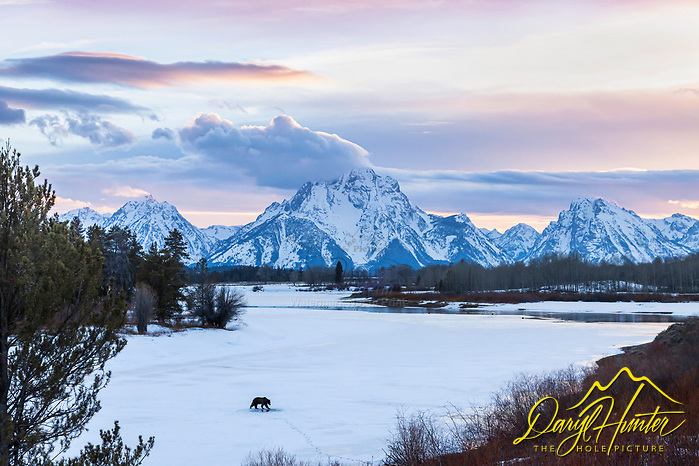 Twenty years ago, seeing a grizzly in Grand Teton was rare. Today, it is common, all grizzlies in the woods are “valuable” but not all are equal. Each comes with qualitative distinctions, just as people do. Bears 399 and 610 are not only mascots for their species; they are ambassadors for Grand Teton National Park and all Grizzly Bears everywhere. 399’s progeny are sure to be delighting untold thousands of Grand Teton Park visitors for years to come. In April 2012 all the bears emerged from their den, #610 was the first to show up and what a show her family put on shortly after emerging. #399 wasn’t far behind but not long after emerging she got separated from her cubs, we can only speculate why. Most likely a boar grizzly. The two cubs, Brownie and Ash separated from their mother were also separated from one another. As you can imagine the whole bear watching community were concerned but they were often seen as they roamed up and down the valley. Brownie was seen harvesting an elk calf by himself, and later Ash harvested a moose calf and everyone breathed a sigh of relief as they were only one year old but still knew how to hunt. Around the first of June the two cubs were reunited to the delight of many, two can hunt better than one. Another round of sighs by all! By this time they were completely weaned and getting reunited with #399 would be more dangerous than a benefit as since she no longer was lactating she would attract more grizzly boars, the cubs are on their own. It appeared these resourceful yearlings would be able to feed themselves, the only question now was would they have the good sense to stay out of the road. On June 21, 2012 Brownie was hit by a car and Ash has disappeared into the wilderness and hopefully is safe. On 5/17/2013 Grizzly 399 produces triplets again for our viewing pleasure? Grizzly 399 produces triplets again, or so it seems. Absent is the red ear tag bling that positively identified her in the past. 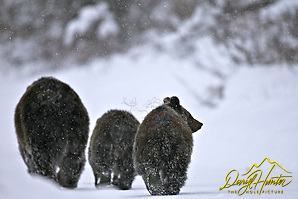 Nonetheless a 400-pound road tolerant grizzly sow has shown up in Grizzly 399’s territory with three new adorable cubs. With my caveat stated, we will assume this is 399. This prolific sow produced her first cub around 2001 and her first triplets in 2006, the second set of triplets in 2011 and now a third bunch of fur balls for spring of 2013. As much as people all over the world have grown to love grizzly 399, although unlikely, I hope this is a different sow. 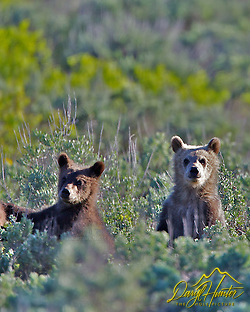 The reason being, the only know surviving cub of 399’s 2011 crop of cubs is the cub her daughter, grizzly #610 of the 2006 crop of cubs, adopted when it got separated from sow 399 in August of 2011. Yep it’s a lot of numbers, are we confused yet? Grizzly sow 399 is now seventeen years old and it appears she isn’t the awesome parent she once was. Grizzlies in the wild live to be about twenty years old so #399 is into her senior years and evidently isn’t as attentive as she once was. These cubs will have a better chance for survival if this sow is a different and younger one than our old, favorite matriarch grizzly of the Greater Yellowstone. On of grizzly 399’s 2013 cubs coming out of the den fat and pretty. 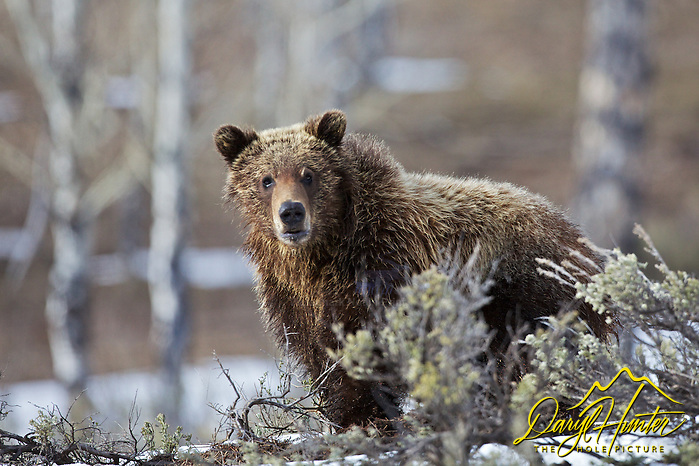 399 emerged from her den with only two cubs; evidently the third was killed somehow in the Gros Ventre Mountains east of Grand Teton Park around October. 610 showed up with a single new cub that didn’t survive very long, too bad, hopefully spring of 2015 will be a better year for 610 and progeny. One of 610’s cubs she weaned in 2013 (Jim Bear #760 put on a nice show for GTNP visitors throughout the spring and sporadically throughout the summer, he became a nightmare for the wildlife brigade who manage traffic in the park. He wandered out of the south end of the park so Wyoming Game and Fish moved him to Park County, Wyoming to an area already overpopulated with grizzly bears. This young grizzly who had caused no problems was chased out of the territory of senior grizzlies to the periphery of grizzly habitat until, once again though no fault of his own he was in the backyard of humans so Wyoming Game and Fish killed him even though he had No, zip, Zero infractions that triggers the killing of problem grizzly bears. Posted on Tuesday, April 3rd, 2012 at 5:06 pm. Filed under: Video, Wildlife Tags: 399, 610, COY, cubs, cubs of the year, Famous, Grand Teton Park, grizzly bears, Jackson Hole, photos, sow, video, Yellowstone	RSS 2.0 feed. You have so many things of interest here Daryl. Thanks for posting on Facebook. Loved the film!! 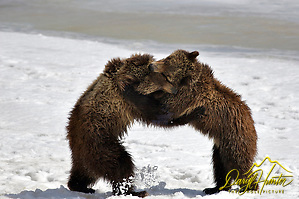 The cubs were so playful and the pictures caught that as well as their need and respect for Mama Bear. I counted 6 wolves circling the herd. Oh, how beautiful. Papa Bear was a natural actor–it was almost as though he had been trained for this. I laughed. Thank you, Daryl, for bringing God’s beautiful, wonderful wild animals to people that cannot enjoy them in person in the wild. Thanks for sharing the stories of Grizzly 399 & 610! I hope to take a trip to the Teton’s in the near future to see these amazing animals in person! As always, great photography and excellent writing. I was at many of those sites and have similar photos, but yours are great. Looking forward to seeing you out there again this year. Roger, yes you were as a mater of fact I wouldn’t have gotten the wolf chase If you hadn’t have yelled “WOLVES” when I was engrossed in chat with Jeff Clow while we were waiting for 610 to come out of the willows. Hey Daryl, just finished watching your movie and it was fantastic. I started loving the scene in the beginning where the mother bears was laying down next to a steam vent(?) and then when you ended it with her just flopping out and stretching, great. Just was a little concerned because at the end part I only saw two cubs. Music was really enjoyable, Great job Daryl. Hi Daryl! I enjoyed reading your insights into the lives of these two bears as much as I enjoyed the photos and video-which were incredible. I can’t wait to see how the story continues this year. Outstanding video, Daryl….you really did a fine job on this! Exceptional writing and wonderful footage! You put this together very well. Thank you so much! Great footage and I loved the history of the bears. It made me homesick to get back out there again soon. Thanks for brightening my day. Great outstanding photos!!! Was the ones you posted of Scarface on the Yellowstone YNet taken of him this year? I was wondering if he was still around, and what area of the park did you see him in? Thanks for the info!! Justin, yes that photo of scarface was just a couple of weeks ago in the Lamar Valley, he was heading east. I haven’t heard anymore of him. He roams all over the park. Thanks for the update Ruffin, and thanks for the link. Daryl….Loved your video, especially the music. 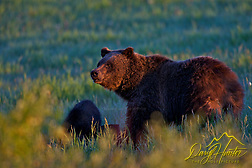 We seen grizzly 610 last year during our visit to Teton National Park. I also have a great love of bears and love to photograph them. Unfortunately, they were too far away to get any good pictures. I really appreciate yours. We might get back there this fall. Thanks for the great video. I watched 399 and her three cubs feeding in the meadow below Jackson Lake Lodge the last week of April as mountain bluebirds flitted about in the foreground. My son, Paul Huser who lives in Jackson, tells me 399 sent her 2-year-old cubs packing in early May. May she live a productive and useful life. Hi Vern, the grizzly you saw in April was Grizzly 610 who is the daughter of grizzly 399. Grizzly 610 and her three cubs but on a pretty good show in April, glad you got to catch part of the show. The bottom 5 photos were of 610 this spring as well as the sunset photo at the top of the page – thanks for visiting Vern. You are lucky to live so close to such wonderful creatures – those grizzly cubs are so cute. Hoping that 610 was NOT the one who killed the hiker but I can’t find any information on the grizzly that had to be put to sleep. Saw 610 the day of the attack so I’m really hoping it wasn’t her.. Thanks for any information. Jim Bear (Grizzly 760) gazing into the water with the caption which read “Reflecting upon a life unlived”.